Ignition Handbook and Database – Fire Science and Technology Inc. The Ignition Handbook is now available in PDF format. Details in our online store. The printed book is out of print. Sorry, no more copies to sell. Only the PDF edition is now available. But note that the PDF edition does have all the corrections incorporated into it, so users do not need to obtain the Corrigenda. 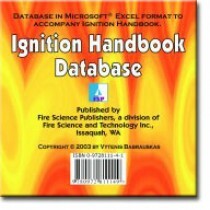 The Ignition Handbook Database is now also being sold as download (Excel files) and not a physical CD-ROM. What is the difference between the Ignition Handbook and the Ignition Handbook Database? This is a question we get asked a lot. So let’s make this clear. The Ignition Handbookis a PDF of the entire book. It is a massive, 1116 page book, in PDF format. Meanwhile, the Ignition Handbook Database is not a book at all. It is a collection of Excel spreadsheets that provide tabular material on the various chemicals, products, and hazmat materials as a database. This allows users to readily manipulate the data, the same way that any other spreadsheet data can be manipulated. After 7 years of preparation, the Ignition Handbook has now been published! 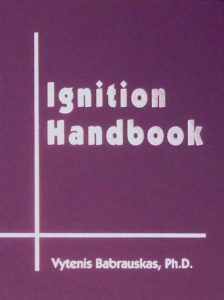 Even though ignition is the most important event in the course of a fire (no ignition: no fire), up until now there has not been a handbook devoted to this vital safety topic. The Handbook is a massive resource, consisting of 1116 pages, tightly set in a 2-column, 8.5″ x 11″ (215 x 280 mm) format. The book includes 627 black-and-white figures, 447 tables, and 140 color plates. The Handbook is divided into two main sections: Chapters 1 through 13 include presentations of the fundamental principles of ignition sources and of the response of ignitable materials to heat or energy in various forms. Chapters 14 and 15 constitute an “encyclopedia of ignition,” containing extensive information on individual materials, devices, and products. Chapter 14 comprises alphabetically-arranged narrative descriptions of ignition properties and hazards for substances ranging from “Accelerants in incendiary fires” to “Zirconium.” Chapter 15 contains database tables giving information on 473 pure chemical compounds and over 500 commercial or natural products, including such substances as dusts, fuels, lubricants, plastics, and woods. For long life and ease of use, the book has been manufactured using the highest quality, traditional book production processes—the book is printed on acid-free paper, the pages are sewn (rather than glued together), and the book is bound in real cloth covers. Two placeholder ribbons are provided. Fire safety is a truly interdisciplinary specialty and includes professionals working as fire protection engineers, fire investigators, fire safety scientists, loss prevention specialists, hazmat specialists, risk managers, insurance adjustors and SIU personnel, chemical process safety engineers, forensic scientists, and others. The educational backgrounds of these individuals will be diverse, especially as concerns their understanding of mathematics. Thus, a special approach was taken in preparing the Ignition Handbook: qualitative presentations and mathematical presentations are segregated into different sections in the book. The qualitative information will be of value to all fire safety professionals, while those without a good foundation in mathematics can omit the mathematical sections. The Handbook will also be of interest to electrical engineers, since it is the first book to examine electrical fires from a systematic, comprehensive point of view. Much of the research on electrical fires has been done in Japan, and the Ignition Handbook contains the first English presentation for most of this work. The Ignition Handbook treats in detail not just ignition of fires but also initiation of explosives and pyrotechnics and explosions of unstable substances. Ignition is defined as the “initiation of combustion” but many unstable substances react in ways where heat is produced by a non-combustion reaction, e.g., decomposition or polymerization. The scope of the Handbook includes the initiation of exothermic reactions in such substances. The sections that deal with hazardous materials will be of special interest to workers in this field, because the Handbook endeavors to present ignition aspects in a more thorough way than can be found in existing monographs. Sample pages of the book can be seen here (420K PDF). The complete table of contents can be seen here (132K PDF). By Vytenis Babrauskas, Ph.D. Published by Fire Science Publishers, Issaquah WA, USA. ISBN-10: 0-9728111-4-1. Note: The Ignition Handbook Database is now also only sold as a download and not as a physical CD-FROM. Details in our online store. Available for purchase separately is the Ignition Handbook Database. For convenience of users, much of the tabular material contained in Chapter 15 of the Handbook is made available in the form of a CD-ROM. Data tables in this CD-ROM are provided in the form of Microsoft® Excel spreadsheets. This allows easy access to information and also permits users who wish to seek to discover new data correlations to do this conveniently. Users must have Microsoft® Excel 97, or later version (or else a compatible spreadsheet program). The database tables provide information on 473 pure chemical compounds and over 500 commercial or natural products, including such substances as dusts, fuels, lubricants, plastics, and woods.